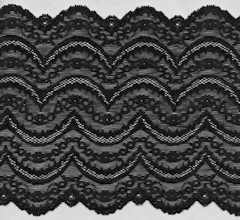 Sew Sassy Fabrics offers several of our stretch lace trims wholesale in full spools. Spool lengths vary. The table shows a nominal length. The items numbers in the table provide links to descriptions and images. 100 yards of SLT016 is folded. Black and White 2 1/2"
Razzle Dazzle Raspberry 2 3/4"
Dark Cherry Delight 5 1/2"
Dark Midnight Blue 5 1/2"
Light Brick Red 5 1/2"
Dark Mint with Polka Dots 6 1/4"
Rich Raisen with Gold Accent 6 1/4"
Black and Dusty Mauve Cross Dye 7 1/4"
Cream and Light Blue Green 6 5/8"